Thoughts on why I return to gambling! I sometimes feel very 'devil may care' about buying tickets.Possibly because I've had cancer and feel my mortality. Sometimes I buy them just for the heck of it. Sometimes I want see if I can control the amount I buy. I must try to be more aware of these triggers. Am worried that I may have messed up Amanda's blog on the Gambling addiction site.I think I replied or commented in the wrong place and I'm wondering why all my replies still say edit - reply.Oh hell,I hope not! Reflecting on distracting the mind. 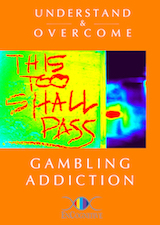 A lot has been said about the effects of gambling and how to counteract the compulsion to do it. I already have several hobbies but they are fairly passive like art,reading,gardening etc.They are good distractions but maybe I should get back into meditation and sports activities. Although I haven't managed to conquer my addiction yet,when I relapsed today I noticed a strong urge not to go too far.The little voice in my head that's usually ignored was listened too,which is encouraging. All I've done so far are on- line are banking and e- mails and that's made using this site properly quite difficult,but I think I'm getting to grips with it slowly. I was quite determined to give giving up a go and did well for about 5 days but relapsed today. I have forgiven myself for this because it's been an emotional time.My brother and I have been trying to work out a workable way of sharing out responsibilities.re.my mothers care.We finally came up with a good plan and I feel a lot more relaxed, and hopeful about everything now. Struggling to get used to the site! I'm a bit of a dinosaur when it comes to going on- line I have only used my I- pad to get information and to communicate with my family and have never been inclined to interact on any of the usual sites,i don't really know how to use this one properly yet and I've even replied to my own replies when I want to add something.Hope it all clicks into place soon or you'll all give up on me.Apart from these blips I'm gaining my confidence back from being here and am now on day 5.i have to go out tomorrow to visit my mother and to shop!! !